The 8th of November will be Bram Stoker’s 170th birthday! Famous for writing the gothic novel Dracula, Bram Stoker had an interesting start in life. Bram spent the first seven years of his childhood suffering from a mystery illness which left him mostly bedridden. During his long illness, Stoker spent much of of his time alone or being entertained by his mother Charlotte who loved to tell him stories, some of them quite scary. Stoker himself said that the time he spent bedridden as a child deeply influenced his future writing. When I think of the young Bram and his illness, I think of Lucy Westenra and her battle with Dracula. I also think of Count Dracula himself, alone with his thoughts in his isolated castle far away in Transylvania. I wonder if Dracula would ever have been written if Stoker had not had such a challenging start to his life. I sometimes imagine what the young Bram Stoker would have been fed during his ailment. I have many foods I go to for comfort and convalescence but one of favourites is porridge. I love rice porridges like congee, cornmeal porridges like mamaliga and classic oatmeal porridges. Bring the water and salt to a boil in a saucepan. Stirring occasionally, cover and simmer for 20 – 30 minutes or until they achieve your desired level of chewiness. Turn off the heat and allow to rest for 2 minutes. Cover and refrigerate any leftover porridge. You can reheat it or have it cold. *Steel-cut oats are known by a few names such as Irish oats, pinhead oats or coarse oatmeal. Tuesday November 8 is Bram Stoker’s birthday. To celebrate, I have done a guest post over at Cordelia’s Mom Still. 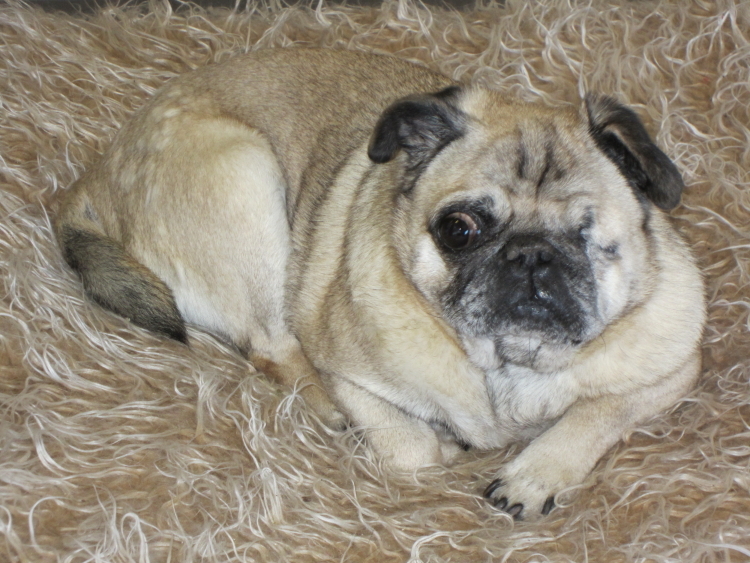 Cordelia’s blog is an eclectic mix of personal anecdotes, photos and other interesting things! Feel free to pop by and have a read 🙂 You can also pop round to Not Cordelia’s Mom if you want to see the world from a very different perspective!! If you’re looking for a recipe, here’s last year’s birthday one for Bram – Irish Coffee Dessert. When Hungarian actor Bela Lugosi first uttered those immortal words in Tod Browning’s 1931 movie Dracula, he didn’t realise he would be giving birth to one of the most famous lines in vampire folklore. These words never appeared in Bram Stoker’s novel. They were unique to the film which is loosely based on the 1924 stage play by Hamilton Deane and John L. Balderston. It was this play that introduced us to an urbane, tuxedo wearing Count Dracula, much different to Stoker’s quite repulsive vampire. The romantic, cape wearing Count would become one of the most popular versions of the mercurial vampire in literature and cinema. His popularity does not appearing to be waning. To celebrate Bela’s upcoming 134th birthday on Thursday October 20, I thought I would drink some wine in his honour 🙂 Sangria, a chilled Spanish red wine drink, is supposedly named after the Spanish word for blood – sangre – which reflects its dark red colour. I have chosen to meld a chilled Spanish sangria with a warm mulled wine. After all, if Dracula did drink wine he most certainly would want it served warm – like blood! Place the juice and sugar in a medium saucepan on medium heat. Stir until combined. Add the cloves and cinnamon sticks. Simmer, stirring frequently, for 5 – 10 minutes or until the mixture becomes syrupy. Add the wine and brandy. Cover and simmer, without boiling, for 5 minutes. Add the blood orange pieces to a heatproof jug. Pour wine over the blood orange pieces. Refrigerate any leftover wine and enjoy cold over ice. You can use any variety of oranges when blood oranges are out of season. Dracula and Lucy discuss the sound of howling wolves. Listen to them, the children of the night. What sad music they make. Do you think it’s sad? 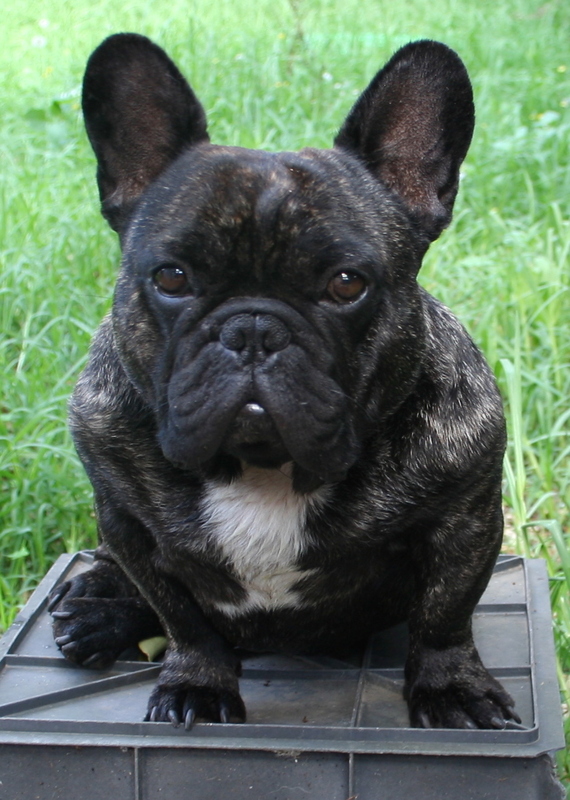 We named our first two dogs for a bat and a wolf – the animals Dracula turns into in the novel. We named our pack WolfChild – as they were our Children of the Night. A year later, near Halloween, two more WolfChildren joined the pack. They made beautiful music together. Then one of our wolves left the pack far too soon for his journey to the Underworld. This year he was followed by first by one, and then another of our wolves as they too journeyed into the Underworld. We are left with only one wolf, our original bat. When I think of my musical wolves I feel sad, lonely and constantly like weeping. The time will come when I, like Lucy, will not feel sad at the sound of howling wolves, but that time is not now. It is Halloween – a time for tricks and treats and honouring the dead. Our dogs are buried in the backyard. Three little graves testifying to the fragility of life and the call of death. They are constant reminders of what we have lost and confronting reminders of what will happen to us all. But they are also comforting. When I look at their graves I remember their lives and their deaths. The pleasure and the sorrow. I remember them playing and running around the yard and I remember laying them in their graves and covering them with dirt. They are always with me and yet they will never be with me again. 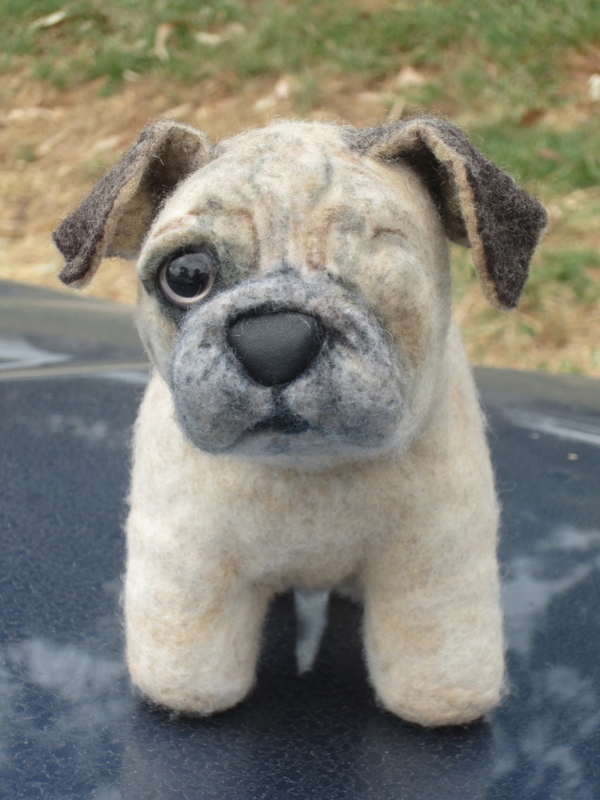 Not long after Wolfy, our first wolf passed away, I saw a post on a pug forum about Shelter Pups, a dog charity in the USA that custom makes small stuffed dogs and cats based on your own photos. 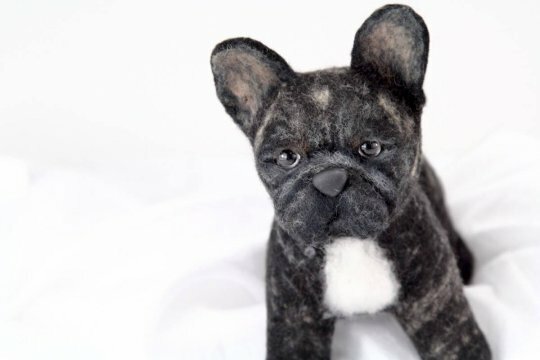 We knew straight away that we wanted one of Wolfy. Little Wolfy arrived on Halloween 2013. 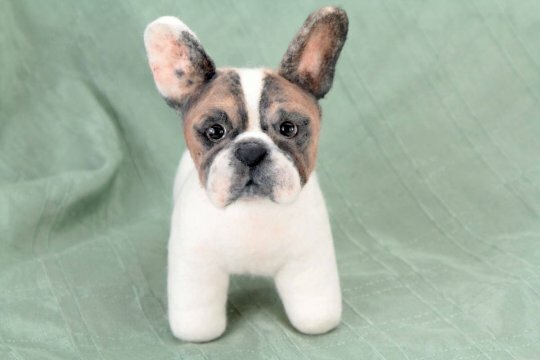 When our next two wolves, Wally and Furghy, passed away, we had little versions of them made. They are in our bedroom where we all slept, watching over us. We also had one made of our remaining wolf, Batty. 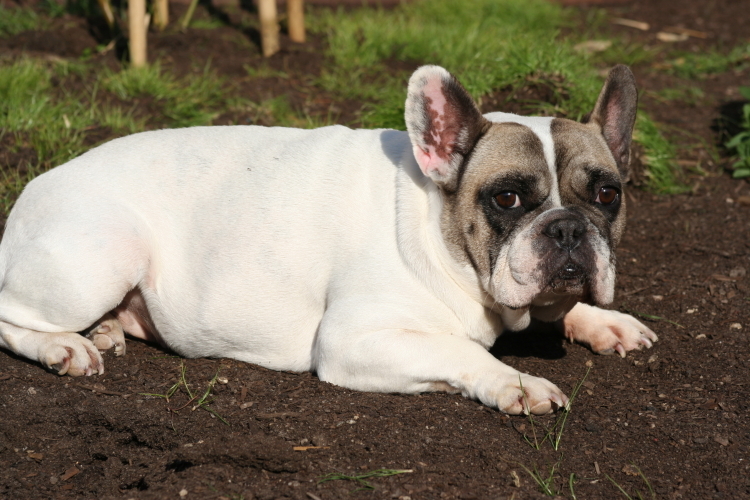 But she won’t be introduced to the world until she passes away, which we hope will be a very, very long time away. Death and food are intimately linked. In honour of the decreasing howls of my Children of the Night I am sharing a recipe for Hush Puppies. These feature corn which is an ancient symbol for birth, death and renewal – appropriate food for mourning and Halloween. 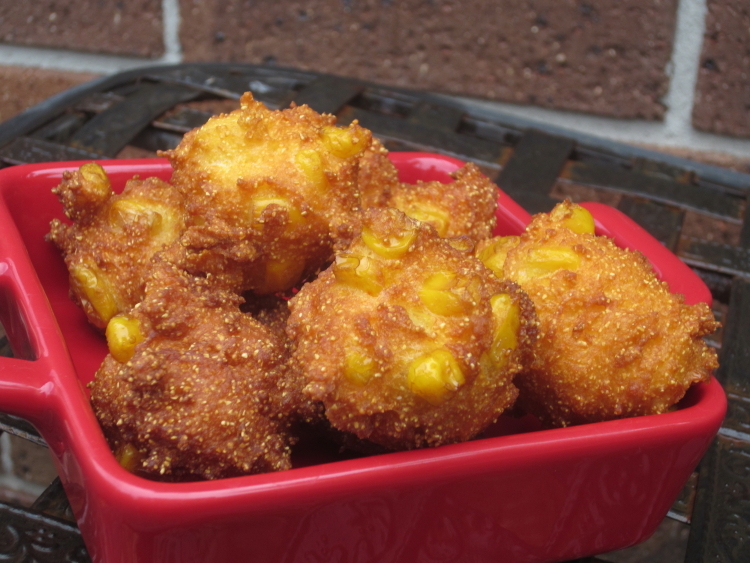 Some stories say these fried cornmeal treats were used to “hush puppies”. Heat oil in a large saucepan to 180C / 350F. Mix together the cornmeal, flour, sugar, bicarbonate of soda, egg and oil. Add the spring onion, corn, salt and pepper. Mix until just combined. Stir in half the buttermilk, adding enough buttermilk for a loose batter that is still thick enough to drop. Drop tablespoons of the batter into the oil, making sure you don’t crowd the pan. Cook, turning them over halfway, for 3-4 minutes or until they are evenly coloured and cooked through. October 20th is Bela Lugosi’s birthday. He would be 133 years old if he lived. Considering he is one of the most famous actors who played Dracula, he may still be living – or undead! 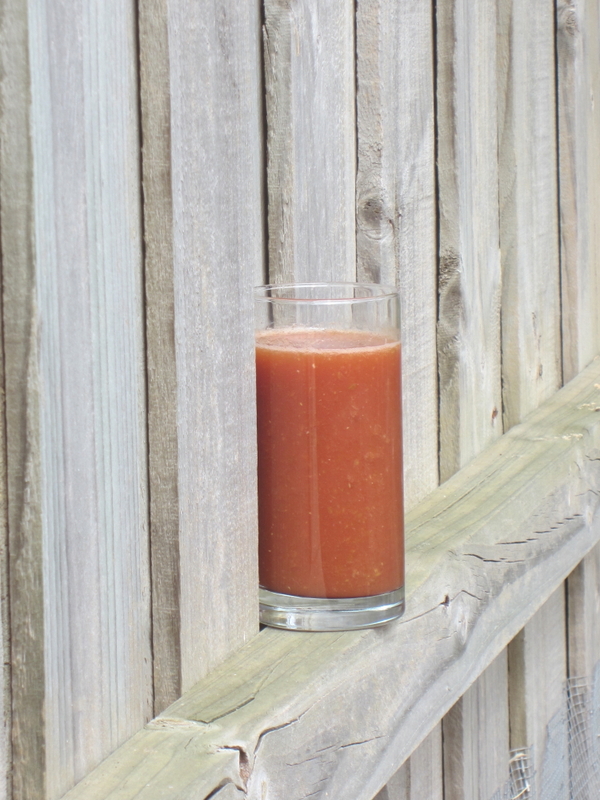 As I continue to explore the five taste sensations through drinks, I couldn’t resist creating a Bloody Virgin Mary. Not only is it a drink most appropriate for a vampire, it is also a celebration of umami flavours. Umami is a Japanese word and is used to describe the unique flavour of savoury. Best examples of umami flavours can be found in aged foods such as cheese, cured foods, fermented foods, meats, sauces, seaweed and stocks. A heady combination of savoury and salty flavours. Place the tomato juice, beef stock, lemon juice, Tabasco sauce, Worcestershire sauce and spring onions in a blender. Blend until combined. Pour into a jug. The mixture will be frothy so chill in the refrigerator until settled before serving. 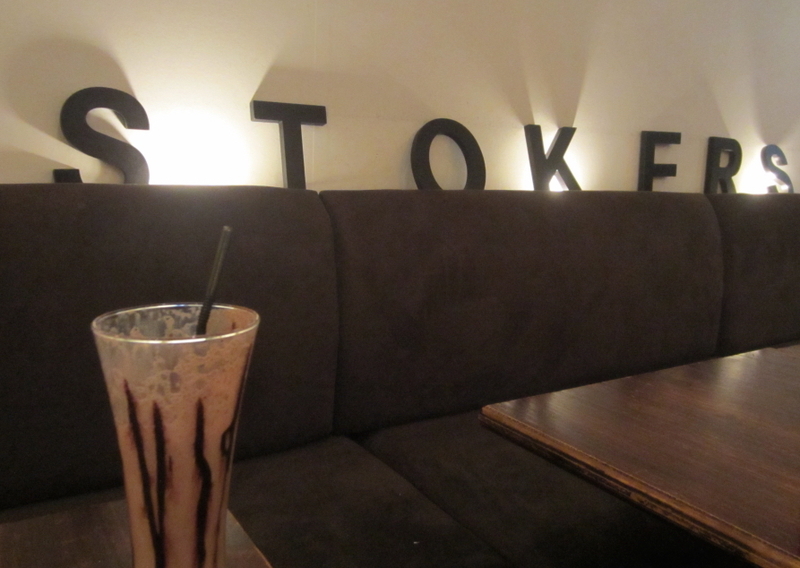 While I presume Stokers isn’t named after my beloved Bram Stoker, author of Dracula, I still can’t help enjoying this quaint little eatery. Dark wood trestle-like tables and bench seating are complemented by dim lighting and eerie old time music. An ancient piano adds to the scenery as does the open fire in the centre of the room. In winter, this lit open fire warms both body and soul as staff gently stoke the fire; hence the name Stokers? The food is delicious. Soup, salad and ice cream sundaes are on offer but the stars are the crepes. 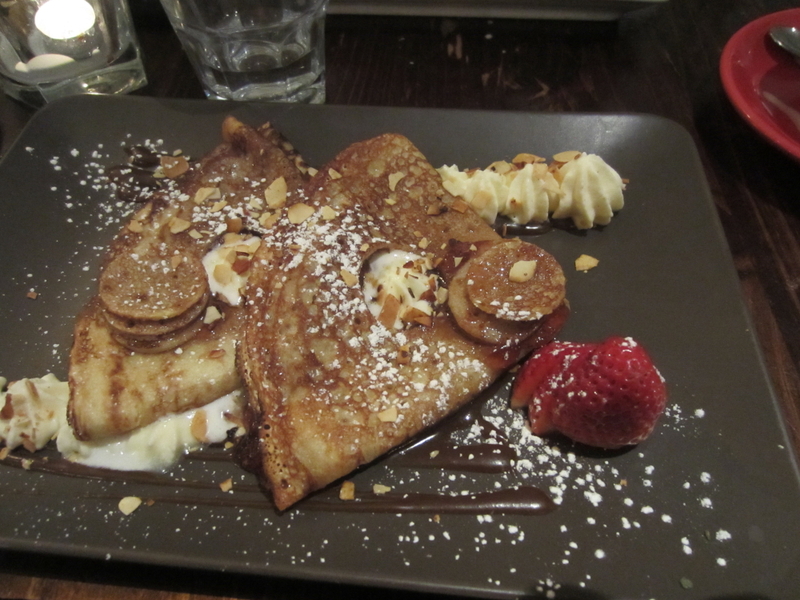 Two rolled and filled crepes are presented on a piping hot plate. Savoury fillings include bolognese, camembert with cranberry sauce and chicken mornay. Sweet fillings include traditional lemon and sugar, passionfruit and chocolate peach. A bevy of hot and cold drinks, including steaming hot Bonox, completes the menu. In fact, you can pop in just for a drink. I know I have spent many a long summer night in Stokers, escaping from oppressive 40 degree temperatures by sipping on their refreshing and cooling pineapple crush. And as the night wears on I find I can’t resist a crepe or two. I wrote this review in 2006 for a food writing course. Stokers had become one of my favourite places to eat since first walking in there in the late 1980s. The name reeled me in and the fact it only opened at night stoked my vampiric fires. The decor and atmosphere were more old world than gothic but the freaky clock on the wall blew me away. When you first looked at it you knew something was wrong and then it would click – it was running anti-clockwise. After a late night of studying, indulging in crepes and drinking, that clock could do strange things to your mind. Sadly Stokers closed a few years ago and my partner and I were devastated. Stokers was one of the first places we went to as a couple. Every year we would try and celebrate Bram Stoker’s Birthday and Deathiversary and Northern and Southern Hemisphere Halloween there. But like a vampire in a horror film, Stokers has risen again!! Have I gone to Stokers and used my voucher? Yes! It was with great excitement and happiness that Paul and I went out for dinner at the new Stokers. We weren’t sure what to expect but happily we weren’t disappointed. The new owners have kept some of the old world charm of the original Stokers but sadly the anticlockwise clock didn’t make it. There is a fireplace which will be warm and cosy in winter and the lighting is just dark enough to echo the original. 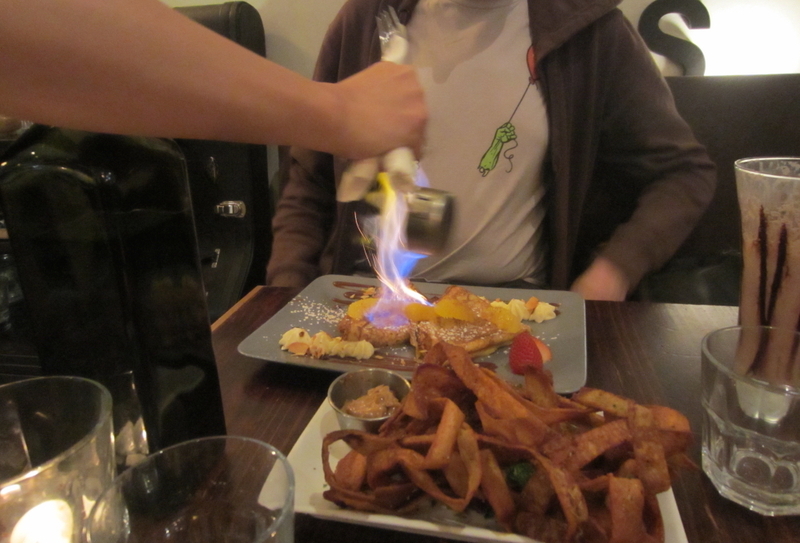 For dessert Paul chose the Pancake Suzette which was set alight on our table. I chose the Hot Jam Donut Pancakes which lived up to their name. They even cut little holes in the pancakes to mimic donuts. Luckily they served the holes with the pancakes! By the end of the evening I was so happily full, I couldn’t fit in a coffee. Luckily they sell the cold drip coffee in little bottles that you can take home. 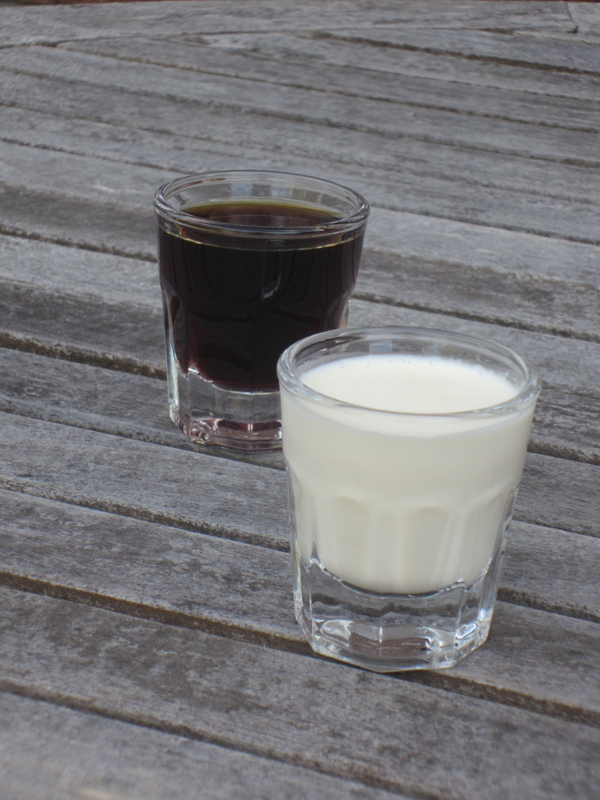 I had mine the next day my favourite way – equal parts cold coffee and cold cream.